According to a survey by Jobstreet.com, the Philippines, compared to other Southeast Asian countries, is among the best in promoting and practicing gender equality in the workplace. The survey, where most of the respondents were college graduates between 18 to 37 years old, also showed a substantial amount of women in management positions. Based on the data, banking and call center industries prove to be the more gender-balanced industries with equal male-female representation at 59 and 55 percent respectively. 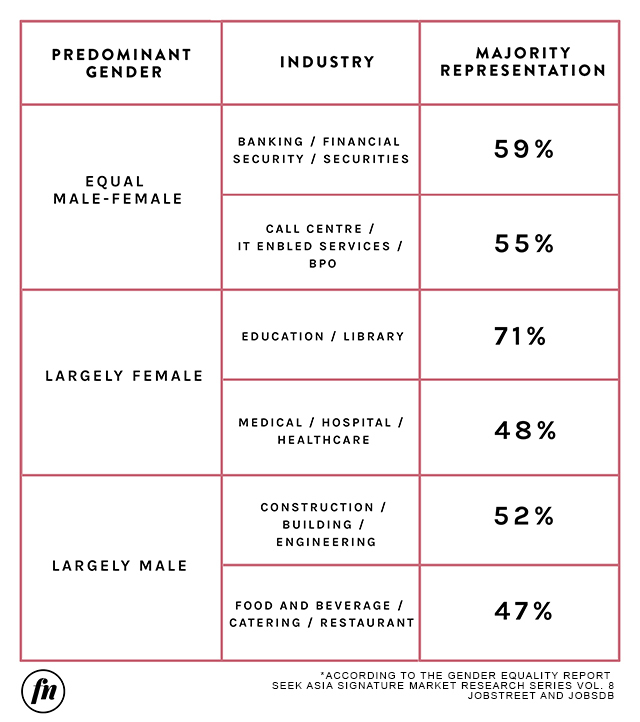 Unfortunately, construction and engineering (52 percent largely male), and education and library (71 percent largely female), still seemingly hire according to traditional gender roles. The study also reveals that in the Philippines, both genders report very little discrimination. Of course, this doesn't mean that gender discrimination or sexism doesn't happen. In fact, the downside is that it could actually mean that people just aren't as vocal about speaking up, either for fear of not getting the support they need or simply because they don't know when they're experiencing discrimination. When many of us think of examples of sexism or gender discrimination in the workplace, people often think of catcalling, hurling insults or sexual harassment as examples. And while those are certainly clear-cut signs of hostile sexism, there are still other ways discrimination can happen, sometimes even under the guise of compliments or special treatment. This is called benevolent sexism, and it happens way more often than we think, according to a study. "While many people are sensitive to sexist verbal offenses, they may not readily associate sexism with warmth and friendliness," says psychologist Jin Goh of Northeastern University, Boston on the Telegraph. The study's co-author, Prof Judith Hall, echoes the sentiment. "Benevolent sexism is like a wolf in sheep's clothing that perpetuates support for gender inequality among women at an interpersonal level. "These supposed gestures of good faith may entice women to accept the status quo in society because sexism literally looks welcoming, appealing, and harmless." Examples of benevolent sexism are being given special tasks like organizing the office party (because "women are better at stuff like that") or pandering to a male colleague's bruised ego "kasi mabait siya 'pag ikaw kumausap." Here are more examples to be wary of, in case you've always felt uncomfortable by how an officemate talks to you without being able to pinpoint why. Make it a personal mission to ensure that each assignment given at work is based on someone's qualifications versus how they look or their gender. If you catch someone making the mistake of doing so, don't be afraid to call them out, and support your statement with data. Are people appealing to your motherly instincts just so they can dump more work on you? Put your foot down and make a list of your non-negotiables. It's okay to be a team player and take on extra work from time to time, but being the go-to person for certain tasks just because you're a woman is exactly the norm we're trying to break free from. Set your rules, and play it fair by asking others to do the same. Example: "I can only extend T-Th but I need to be home for dinner with my kid every M-W-F." The next step is to find a sub and a rotation that will benefit all schedules. Ah, teamwork. No matter the situation, you're always stronger together, and a diverse environment where everyone takes turns doing certain tasks can really cultivate a gender-equal office. Make sure to reach out to all your officemates, male and female, and try to practice being open communication on a daily basis. Remember, change won't happen overnight, so in this instance, consistency is truly key.